Sept. Thursday 8, 1864 Near East Point Ga. We took up line of march at 8 oclock this A.M. and march 8 miles. got in to to this place at 11 this A.M. but did not correll untill 2 this P.M. it has been avery pleasant day. we met our Supply train here to day just from Atlanta. the cars came out and met us this morning. greate cheers from the [boys?]. the Army of Tenn is Staying here. it is only 6 miles in to Atlanta from here. 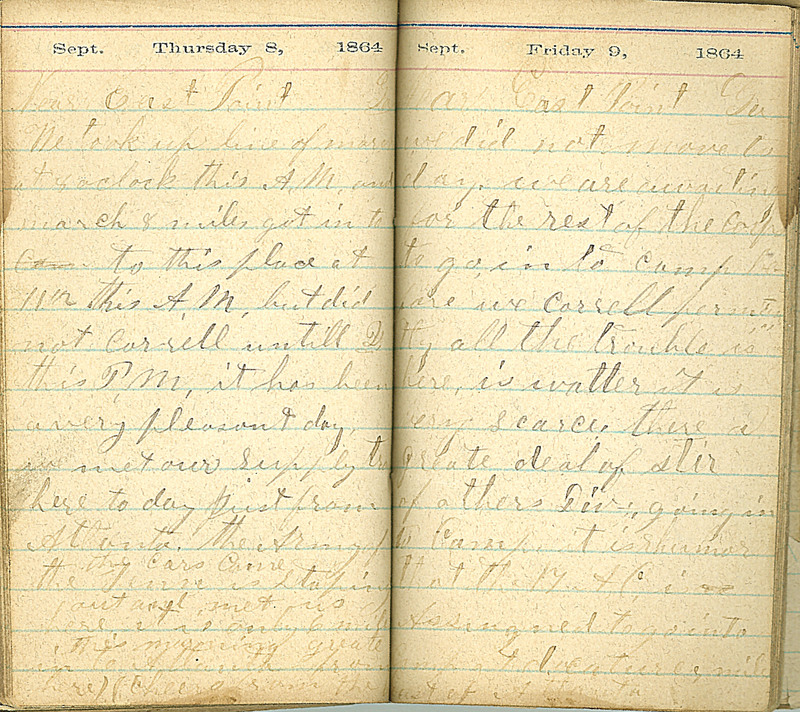 Sept. Friday 9, 1864 Near East Point Ga. we did not move to day. we are awaiting for the rest of the corps to go in to Camp before we correll [permently?] all the trouble is here, is watter it is very Scarce. there a greate deal of stir of others Div. going in to Camp. it is rhumor that the 17 A.C. is Assingned to go into Camp at docature 3 mile East of Atlanta.